Ready for a Disney cruise or does he just love nautical stuff including Mickey?? 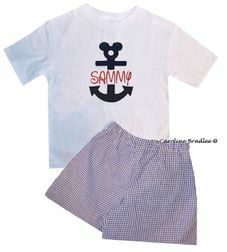 This little monogram personalized Mickey Mouse anchor shirt or shorts set is perfect! 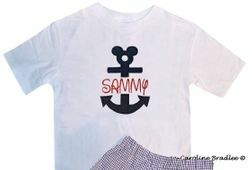 We start with a white shirt or navy shirt and applique it with a navy or silver Mickey Mouse anchor. In the middle of the anchor, we monogram your little one's name in red Disney font or red circle block font 3 initials. If you choose the outfit, the shirts are paired with navy gingham shorts.